Just in time for early Christmas season planning the book “The Legend of St. Nicholas, A Story of Christmas Giving” arrived on my doorstep. For many years we have added a book or two to our family library for the holiday season and I am delighted to have this beautiful addition to the collection. 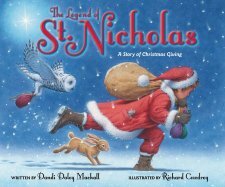 This retelling of the St Nicholas legend is modernized, but told in a lovely gentle tone. My first impression of the book was from the dust jacket. The dust jacket is colorful and has wonderful texture. A finger brushed across the title finds smooth raised letters and then glittery snow. While I find it important to stick to a more historical retelling of St Nicholas, this book’s modern spin may help children associate better with the story, and be an additional encouragement. It is challenging to help children think outside of themselves and sweet stories are often a great way to draw attention to the beauty of generosity. Richard Cowdrey’s favorite things to draw and paint are the things that reflect the awesomeness of God and His creation. From vast landscapes to the littlest bug on a leaf, Richard marvels at the beauty in the details. Richard’s bestselling children’s books include Bad Dog, Marley and A Very Marley Christmas. Thank you to BookLookBlogger network for the opportunity to receive and review this book.